I suppose the most surprising turn of events for me this season was the deposition of my perennial Naugatuck favorites, the Mickey Finn and the Same Thing Murray. Both flies hooked one salmon each for me, but that was it. I'm surprised but not disappointed. They were replaced by two of my confidence flies in wild salmon fisheries, the Sugerman Shrimp and the white tail Green Machine. Rounding out the top three is the German Snaelda, which was the only top three holdover from last season. I'm happy to see the Sugerman Shrimp tied for top honors. If I had to pick one salmon fly to fish for the rest of my life, that would be the one. I don't know why it has worked better for me abroad than at home, but maybe the trend is changing? Two sizes worked for me this season, sz. 2 and sz. 10. As you can see, small or large, it's a terrific fly. The Green Machine made the cut because of its performance on one day of fishing, hooking and landing three salmon (in the same pool) in a very short amount of time. For some reason, when there are salmon in this particular pool, they seem to like buck bugs. I haven't found that to be the case in other pools, at least not to the same extent. My first grilse of the season (Bonaventure) was caught on the same fly, so it must have had some good mojo attached to it. The German Snaelda wins the medal for top tube fly of 2014, same as last season. Like the Sugerman Shrimp, it was effective in different sizes, from the diminutive micro conehead tube to a medium sizes Snaelda, tied on a .5", thick walled, copper tube. I didn't move anything on the larger, 3/4" copper Snaelda this season. I was sort of surprised by that. I hate tying Snaeldas but I sure like fishing them. I didn't keep track of how many trips I made to the river. I think it was a little less than last year given the late start we had this season. I hooked sixteen salmon and landed all but two. I'd venture to say almost everyone hooked far fewer salmon this fall than last fall. That was definitely the case for me. In a typical season, I average about two (salmon) hookups per trip. Last season, I averaged about 2.5 per trip. Without exact figures, I think I averaged a little over 1 per trip this season. My landing percentage was up from last year, however (by about 8%). Some years I keep better data than others. I didn't do a very thorough job this fall; basically just salmon number, fly, size, and pool. I have very little written record of 2012, so at least I did better than that. I looked back at my 2011 record the other day and that has incredibly detailed data. It's very helpful. I am going to try to get back to that next season. Oh yeah...I didn't lose a single pair of hemostats this season! Amazing! I don't know whether this means anything or not, but I didn't lose any that I hooked on a tube. I lost two on conventional flies (Mickey Finn & Sugerman sz. 2). Of course, I hooked just over twice as many on conventional flies as I did on tubes, so maybe that has something to do with it. 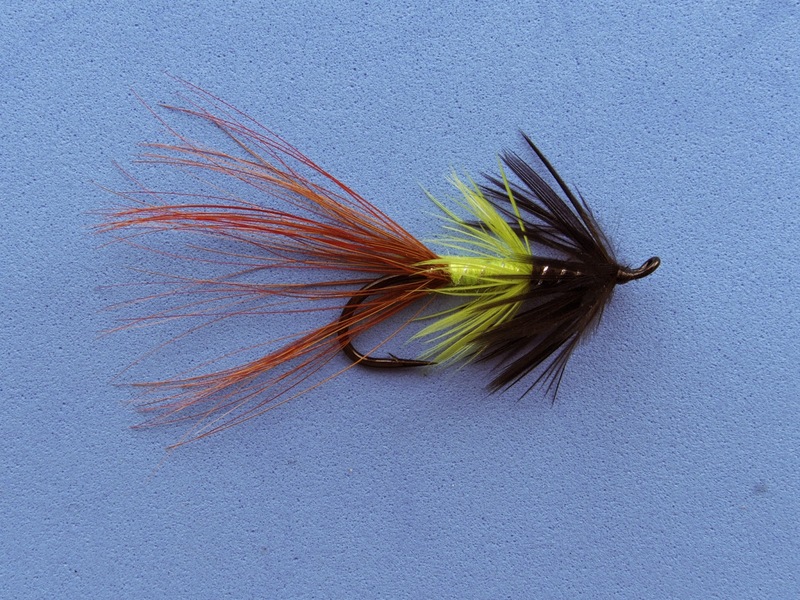 I'm going to cut some flies out of my online fly shop and add others. I should have a supply of Sugermans and Green Machines ready to go for next season. As much as I hate tying them, I'll probably add some Snaeldas, too. I might do a little fishing in the winter and spring, just to keep cabin fever at bay. I'll try to post some reports if I go. After a little break, I will be doing some tying for spring, most likely Sunrays, Mummichog Muddlers, Gurglers, and Samurai Dogs for sea run browns and stripers. I also plan on posting more tying videos, so check back for them. The next couple of posts will be gear reviews. Stay tuned and happy New Year! Glad to see the orange Sunray Shadow still made the list! Barely! Hopefully we'll have normal water again in 2015 and that fly will work as well as it used to.